I hope you all had a great time in Ireland and really enjoyed yourselves! We want to see your pictures and videos! We are putting together an 2012 Ireland Trip DVD and we would also like to see your pictures on the band website. You can either upload pictures to our flickr group by going to http://www.flickr.com/groups/kennedyband/ or if you have a lot of pictures you can submit a CD. Videos should be submitted on DVD. The deadline for submitting pictures and video will be March 31st. It will be a 6 week process to complete the final Trip DVD from April 1-May 15. Then we plan to have a big Movie Premiere of the 2012 Ireland Trip either at a movie theater or our very own Kennedy Performing Arts Center in late May or early June. If you haven’t ordered your trip DVD and would like to do so, go to http://www.kennedyband.org/DVDIreland2012OrderForm.pdf. Orders received one week prior to the Movie Premiere, will have their DVDs presented to them at the movie premiere. 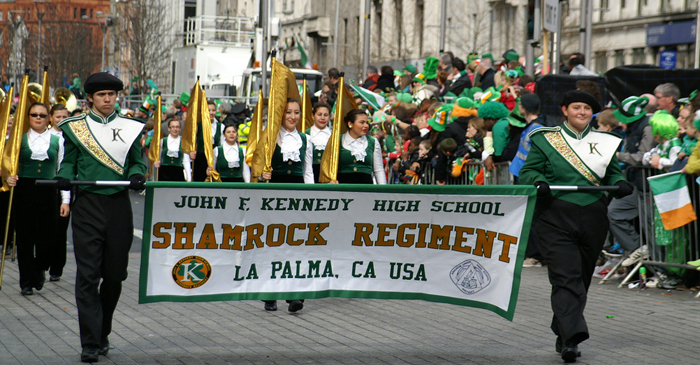 On 17 March 2012 St. Patrick’s Day after the Band and Colorguard board their buses to their assigned area for the parade, the parents who want to watch the parade are taken to a specific drop off area. You are dropped off soon enough that you can be right in the first position on the ropes because the crowds really start coming as the time for the parade approaches. By the time the parade starts on both sides of the street, the crowds are 15-20 deep. Our land tour operator Grand Tours has let us know there is a limited number of grandstand seating available. The seats are located in the Christ Church/St. Patricks Cathedral grandstands which are located towards the latter end of the Parade Route. They sell for 60 Euros each which equals $83. THESE ARE SELLING OUT FAST. So if you think you would like a grandstand seat, we have to order from the St.Patrick’s Festival Office ASAP. Just a reminder we have our All Hands meeting for Ireland Travelers on Thursday, February 23rd at 6:30pm in the band room. I have received emails from some parents asking if they can come and yes we would encourage parents coming. If my daughter was going on the trip, I would be there. Then you get the information first hand. When you arrive at the band room you will need to check in to receive your manila envelope with travel materials and also your travel shirt. Handing them out at the start will save time at the end. Foreign currency though will be handed out at the conclusion of the meeting. A parent must receive the foreign currency. It will not be distributed to a student. One new development is we might have to refund all of the money collected for the customized luggage tags. Regrettably our trip logo’s colors do not look well on a white background which the luggage tag is. We are trying to make some changes that hopefully will be agreeable to the luggage tag vendor and ourselves. If not, there if you paid using your Family Savings Account, I will put the money back and if you paid via check or cash, you will receive a refund. If you haven’t ordered your foreign currency or would like to order more, I can accommodate your request. I would order through Bank of America’s online website. The exchange rate on the website isn’t as good as the one we received when we exchanged the $40,000, but it will be far better than anything you would receive if you waited to exchange at the airport, etc. To make a payment toward the Ireland Trip, click here. Please note there is a 3.5% convenience fee for payment by Credit Card. To maintain the same trip cost and not pass through a $400 increase due to increased air fare cost and the exchange rate, we asked our tour operators to come up with a solution. We knew the two days in London were very expensive. The suggestion was to cancel the two days in London and add a day in Ireland. Doing this meant we could keep the same trip cost with no increase to the travelers. Also, we adjusted the exchange rate from 1.30 to 1.44 which reflects the current currency exchange. We have built in a fluctuation factor that if we our tour operators can buy the Euro at less than 1.44, they will pass the savings on to us. If lower airline fares become available, that savings will be passed onto you also. We viewed this as the best decision to make considering the circumstances. One cost that has not been included in your trip cost is the instrument baggage fees and rental of instruments. We did an analysis in January and we are projecting that cost at approximately $60 per person. Grand Tours is working our list of instruments to rent because it would be too expensive to transport them because of the weight and linear inches. Now that we are fairly stable we will be going back to our freight company to get a quote to transport the other instruments, uniforms, supplies, Colorguard Flags from Kennedy to Dublin and then from Dublin to Kennedy. Using them to perform this statement of work rather than bringing it on the airlines with your suitcases, is only $7 more per person. The best money we will ever spend. To just have to worry about suitcases checking into the airlines and everything else is transported and there when we arrive, is such a relief. Check out the adjusted itinerary based on an Ireland Only trip from March 11-19, 2012 (see link above "Itinerary as of 5/13/2011). You will see what we have added for the extra day in Ireland. We have provided two exceptional choices on that day. I have also attached pictures with all of the highlights of the trip (see link above "Pictures - Highlights.") These pictures are also in the Band Room on a poster board. I wanted to provide a very clear vision of how magical the trip to Ireland will be. One thing not shown on the itinerary because it was just confirmed yesterday was that we have requested our land operator Grand Tours to add shopping at Blarney Woollen Mills on Friday, March 16, 2012 after seeing Bunratty Castle. The Blarney Woollen Mills is right across the street. It is the premier department store in all of Ireland. It has everything you could imagine. It will probably be the one place to make the vast majority of your purchases especially for souvenirs. Also, on the 2nd floor is a restaurant with the best Irish Stew. Norman Travel International our air operator also let us know that Virgin Atlantic Airlines is in play as a possible replacement for Continental. Norman Travel International will continue to seek the best possible airfares and fight schedules right up until we are ticketed in January 2012. We are in constant contact with them and Grand Tours our land operator seeking the best for you. Both companies have 30+ years experience in the travel business. They are experts on Ireland. Stay tuned for further information! *Adobe Reader needed for files with asterisks. Click here if you need it.